Chris Onstad’s Achewood, for those who aren’t familiar, is a webcomic launched in 2001 and follows the frequently surreal day to day lives of of the bear/cat/squirrel/robot/Keith Moon’s Head In A Jar denizens of Achewood, a fictional California neighborhood roughly based on Palo Alto. “Mexican Magical Realism” ponchos, a freestyle sapphic erotica fight for the ownership of William-Sonoma, jokes about depression, and prank phone calls to famous comic strip characters are just a sampling of the wide and inexplicable range of topics found in Achewood‘s massive archive. 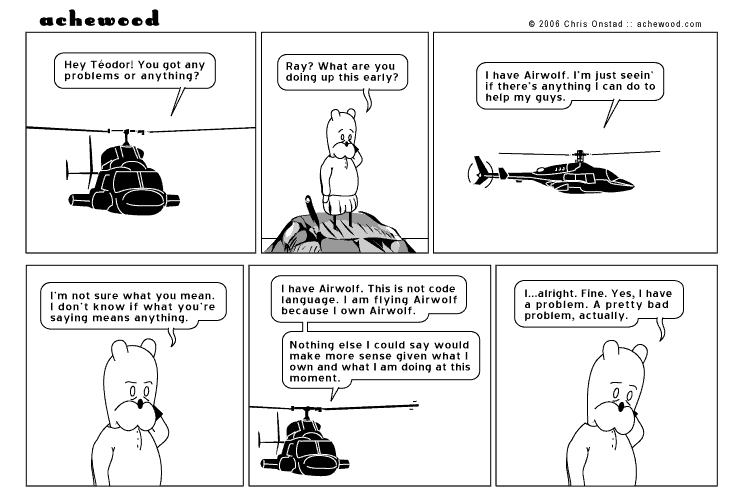 Although Onstad stopped regularly updating the strip in June of 2012 due to personal issues, Achewood triumphantly returned to its weekly schedule last summer. Achewood, despite it’s large and passionate fanbase, is a pretty inaccessible comic by design. Onstad’s strips tend to eschew traditional punchlines in favor of humor that comes from gallows humor, absurdism, a character’s mannerisms and, especially, the comic’s use of unusual, character-specific language. Aside from Homestuck, Achewood is about the only comic I can think of that’s really concerned with language; it’s integral to the strip and it’s characters. The way Onstad’s characters talk in Achewood is somehow both incredibly alien and weirdly familiar. As a new reader, there will be jokes you’ll get immediately but I think for most people it’ll take a handful of strips before you’re totally on-board and aware of what Onstad’s trying to do. Here, Ray and Téodor’s totally dissimilar speech styles and the nature of their conversation suggests that, while they’re friends, there isn’t nearly as much familiarity as with Ray and Roast Beef. These aren’t characters who grew up together, they’re (comparatively) recent friends and we know all this just from a sample conversation. And because we know this, the gag at the heart of the strip (“everyone underestimates Ray”) is even funnier. 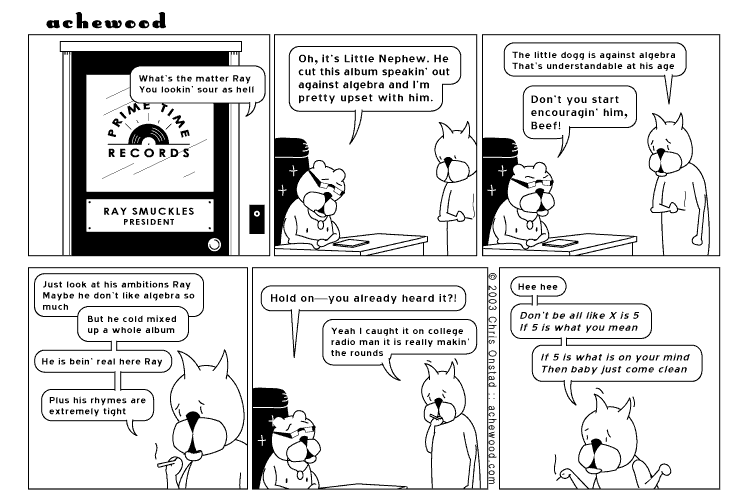 Many comics have attempted to incorporate music/singing to varying degrees of success, the rap portion of the classic “Notorious L.I.N.C.O.L.N.” strip above works because Onstad’s already acclimated us to how Ray and Roast Beef talk with one another. Beef’s “what’s UP mother fucks”, Ray’s “He Gets With Ladies But In The End They Do Not Like Him!” we’re clued in now, we can see the language is shorthand for a relationship that deepens the joke. We’ve walked the streets of Achewood abit and we recognize the landmarks. The flipside to the speech patterns of characters like Ray and Roast Beef are strips where Onstad focuses on bizarrely intricate formal speech, which tend to involve Cornelius Bear. While Roast Beef and Ray are characters with very casual speech patterns that are heavy on slang, Cornelius Bear is an older, stuffed shirt sophisticate who speaks as you’d expect. With Cornelius and other “cultured” characters (like the Mr. Teal operating system seen above), Onstad has them speak in what’s essentially a parody of formal language; it’s just as inaccessible, but on the opposite end of the spectrum. The effect here is, again, a sense of history through speech. We buy this consciously faux-cultured speak and we laugh along with it. In many of Cornelius’ earliest appearances before Onstad had totally nailed his character down, he speaks in a kind of default pattern ala Téodor and the joke quality very clearly suffers for it. 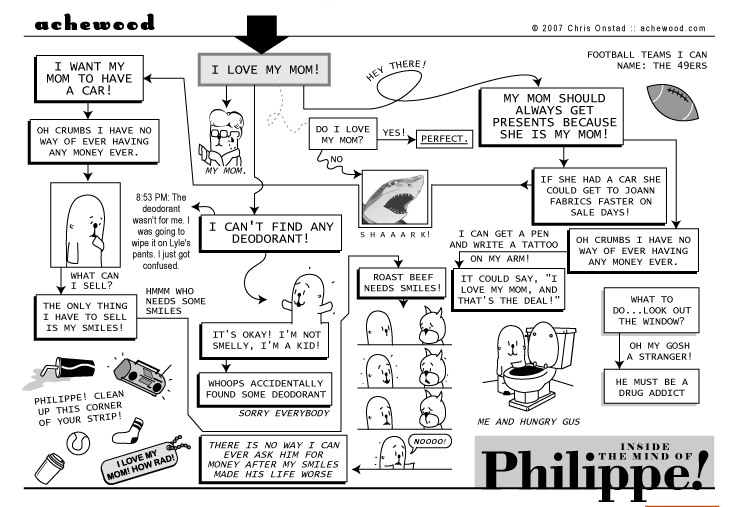 Onstad avoids using cliches like cutesy mispronunciations to sell the audience on Philippe’s age, instead he gives us strips like the above where his age-appropriate intelligence and curiosity come across in the dialogue (I still crack up at that totally out of left field cut away to “S H A A A R K”). 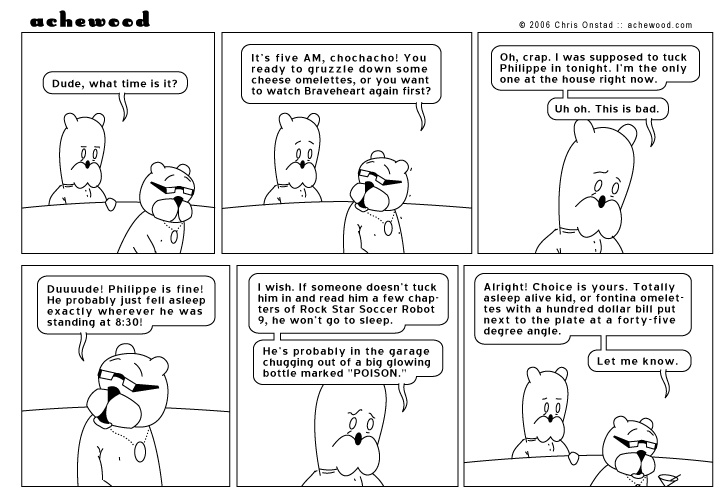 The end result is that not only do we understand who Philippe is, we get to see the unique way he views the world of Achewood. It’s clear that Onstad puts a staggering amount of thought and effort into considering language when writing Achewood. Not only do his turns of phrase, his word choices inform the characters that make up the strip, they give the strip as a whole a flavor of it’s own; a lyrical energy that keeps us returning in spite of delays and personal hiatuses. I don’t know that you can totally explain why something’s funny but once you get past the initial language barriers of Achewood, there’s a sweet spot you enter as a reader, where the comic genius of Ray trotting out “Horse Dogg Maniac” is enhanced a hundred-fold because now you’re in on the joke. You know the password now, welcome to the champagne room, try not to gruzzle down too many cheese omelettes before we start Braveheart. What a great article! I think language ought to be something that writers put more focus on. The devil’s in the detail’s, after all. Oh, sorry, *details. See what I mean? Yes, and the author wrote an entire article about peculiar language in Achewood. You should read it some time. Hey man, great points you raise, I’m glad somebody else appreciates the language and diction of Ray and Beef. Read this for years loved it there were blogs for each character – totally agree with the article reading it was a nostalgia trip thanks!